BOSTON, MA – The Boston Chinatown Neighborhood Center and the Chinese Progressive Association celebrated the graduation of their fourth class of the Pre-Vocational Skills with ESOL for Retail Employment training program. Nine students graduated, with three having already begun work in their new customer service positions. Two of the graduates will be working as cashiers at local supermarket chain Roche Bros., which is a longtime partner of this program and has provided expert retail knowledge and behind-the-scenes tours to all students of the class. Joe Curtin, who is the Director of Recruiting, Training, and Development at Roche Bros., was the keynote speaker at the graduation. 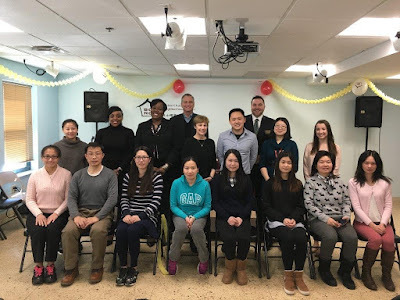 Already familiar to the students from his energetic and informative tour of the store’s Downtown Crossing location, Mr. Curtin impressed upon the graduates the importance of continually striving for better English proficiency. He urged the students to step outside their comfort zones and take risks with language. Mr. Curtin was excited to have hired two of the graduates and emphasized that at Roche Bros., there is always opportunity for people who are willing to work hard. The graduation was also attended by representatives of the City of Boston Mayor’s Office of Workforce Development, which supports the program through the Neighborhood Jobs Trust. In a short speech, Marsha Gelin of the Mayor’s Office of Workforce Development recognized the students’ achievements and wished them the best in their future careers. Next, attendees heard from Alison Fong, the co-founder and owner of Bon Me. Ms. Fong, a former Chinese Progressive Association intern, now owns an Asian-inspired restaurant and food truck business with over 160 employees across Greater Boston. Bon Me currently employs six graduates of the program, and Ms. Fong provided insight into their progress at her company while encouraging the most recent graduates to apply. The 10-week training provides low-income immigrants with the English, customer service, and mainstream job search skills needed to obtain and maintain employment in the retail and customer service industries. Students also have the opportunity to speak to local employers, including Roche Bros., Bon Me, and Uniqlo. Registration is now open for the next training, which is set to take place this summer. Students must meet low-income requirements and be residents of Boston; those interested should go to CPA at 28 Ash Street, Boston, to register and to schedule a time for an English test and an interview.